Richelle Olsen is a cycle tourer, and the founder of the body positive adventure organisation, Escaping Your Comfort Zone. 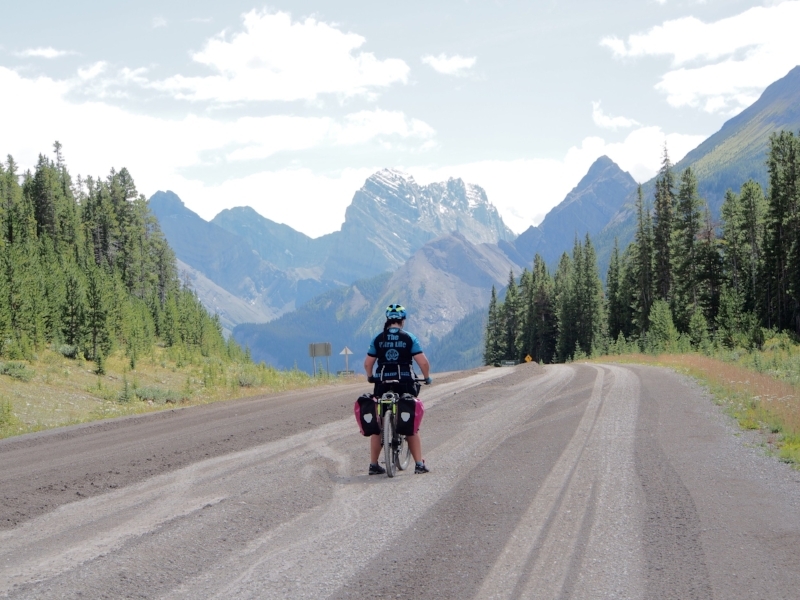 Richelle has cycled her way on many a journey including bike touring in the Italian Alps and from Canada to Mexico. Richelle shares with us her top tips! For many people, the thought of bike touring, even just an overnighter, seems both exciting, but super daunting. There's so much to think about, and equipment to consider. But the message I want to get across to women is that it need not be daunting. Yes, there's tons of planning that goes into a long distance bike tour, but let's start with just an overnighter, somewhere local, where, if a piece of equipment isn't ideal, it's just for one night! Here are my go to tips. Use The Bike You Have. Almost any bike is perfect for an overnight bike tour. Now this may seem obvious, but the number of people who tell me they would love to do an overnighter, but they don't have the "right" bike. But you know what, the "right" bike is the one you have! Especially if it's just for a night or a couple of nights, you don't need a specialist touring bike. Ideally, the bike should be able to have a pannier rack attached, but, if not, no worries, there's a range of pannier racks available for bikes that don't have the particular attachments. At a stretch, you can use a backpack. It's so easy to get wrapped up in how many kilometres you can smash out in a day to feel like it's worthwhile for an overnight trip, But you know what? There are no rules! Before you set a route of 150kms, think about something shorter, and taking the time to stop and appreciate the sights along the way. Take time for a picnic and photo stops. I once did 20kms in one day through the Italian Alps, by the time I had four gelato stops, and a pizza stop, I'd taken all day! A marvellous day it was too! Now I'm all about minimalist travelling. Afterall, everything you take is weight that makes each pedal stroke that little bit harder. So I'm a firm believer in taking only the essentials. But when you have spent the day on a bike seat, the last thing you feel like doing is setting up camp, and sitting on a hard, sharp rock, or even worse, sitting in the dirt. After doing that for my five-month tour from Canada to Mexico in 2015, I splurged, and, for my solo Europe tour, I took my new fave piece of kit, my mini camp chair. Realistically, it only weighs 900g and doesn't take up much space, but it's worth more than it's weight in gold. I don't know about you, but for me, there's nothing like the outdoors to build a cracking appetite. So take some of your fave foods. And if you are the type that brings a camp stove to cook dinner, bring pre-dinner snacks, you know, the food you shovel in while you set up camp, and get dinner started. While we are on the subject of dinner, don't feel the need to take everything to cook up a storm. When I'm on an overnighter, I don't even bother taking a stove; I eat food that doesn't need to be cooked. The last overnighter I did was out the back of Warburton. I was out there alone and did not see a soul for the whole ride until the next morning when I returned to civilisation. I had forgotten my external charger for my phone, so I had to conserve my battery in case of emergency - which meant switching my phone off and just being. No photos, no internet, just me, out there in the wilderness. Yes, it felt weird, but noticing the sounds, the smells, and a general appreciation of where I was made me feel like I had been out there for way longer than just a night. Give it a go. Afterall, we could all do with switching off now and then. So what's stopping you? Grab your bike, and find yourself an adventure!